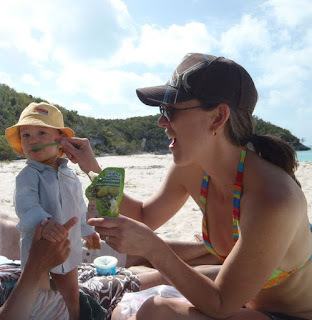 Organically Good Baby Gourmet: Mother's Day Giveaway! 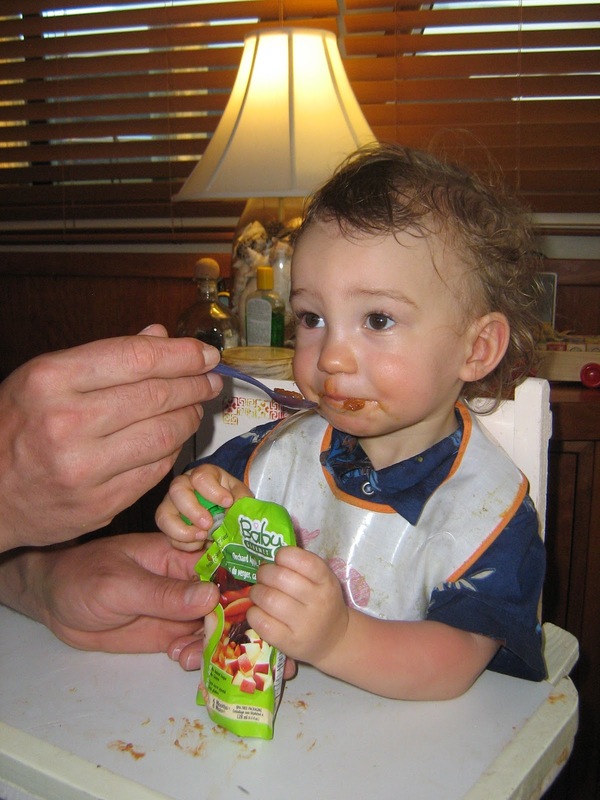 Organic baby food, with no fillers, no added sugar or salt, 100% organic ingredients and in a easy to use, resealable, bpa-free container! (It even has a 15 month shelf life!) Convenient... for those times when you just can't make your own. Babies love it - guaranteed! that cares about what your baby eats. It is a perfect addition to your baby's feeding repetoire. These milestones in a baby's life are important to a Mom. Ones never to be forgotten. So for Mother's Day, Baby Gourmet has put together a giveaway to make a Mom's job just a bit easier! 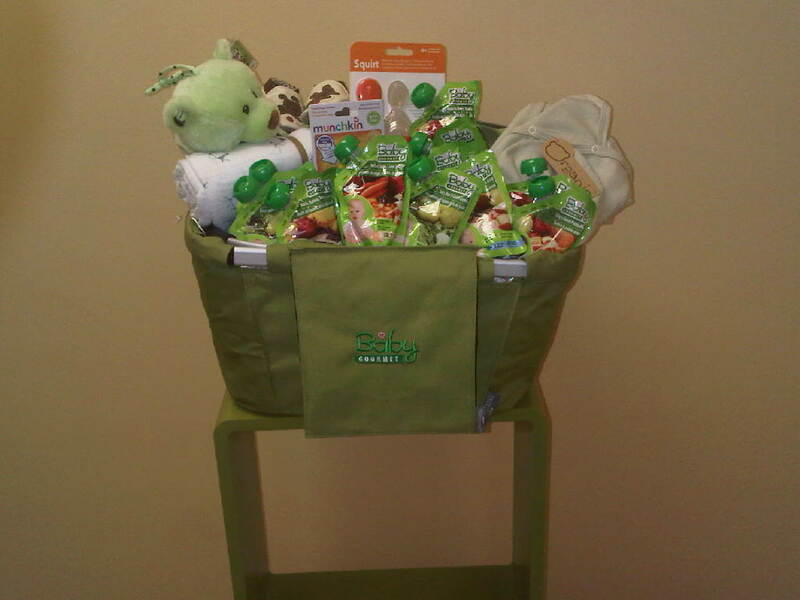 Basket filled with Baby Gourmet baby foods and other luxury baby items. MOM's (sorry no fellas!) Think of your favourite memory from your first year of being a Mom and simply leave me a comment, telling me all about it! Be sure to leave me your email address too, so i'll know exactly where to find you! The winner will be chosen by SamiJoe (moi!) and announced on Mother's Day, Sunday May 8th, 2011. Giveaway ends-- Saturday, May 7th, 2011 @ 9pm MST. Open to all Mom's in Canada and the U.S.A.
Want to 'like' Baby Gourmet on Facebook?? Click HERE. That really was a convenient and clean way to picnic with Baby. Because it comes out of the squeezre top, no beach sand got into it, and we had no mess to clean up when Arnold was all done. Left overs (if any) were so easily put back on ice to wait for the next snack. ps. it's better in the Bahamas! My favourite moments would have to be when I bring my little girl in to bed with Daddy and I in the morning. It's such a treat for the three of us to cuddle and bond with each other before we start our busy days. I couldn't imagine my day without that special time! my first child and I sometimes I think it's still sinking in that I really am a mom now! crying slowed down. There were a few sniffles and then he rested his head on my shoulder. I closed my eyes and gave him a squeeze. He just wanted his mom, and that was me. I will never forget how that made me feel. My first year as a mom was when I was eighteen years old. I gave birth to a perfect and precious little girl and because I wanted her to have the best life possible, I gave her up for adoption to a wonderful couple that couldn’t have children. As much as I wanted to keep her, I loved her too much to be selfish. She is twelve years old now and has two loving parents, a great life on a farm, a pony and, most of all, the stability that I would never have been able to give her. The moment when I handed her to her new parents, as bittersweet as it was, will always be my favourite memory from my first year as a mom. My favorite moment of my first year being a mom was the moment I first held my little man. I was young (19) and very scared about giving birth. After being induced and laboring for an hour or so, the baby's heart rate dropped dramatically and I needed an emergency c-section. This was the scariest thing I had ever been through and I couldn't help but cry like a baby when they told me. Everything happened so fast and the worry was almost too much to bear. But luckily we made it through and before I knew it I had a perfect little baby in my arms. I have never been more relieved in my life! He is eleven now and still has a knack for bringing the drama and excitement to our lives that he entered the world with. My DD is only 5 months old so we don't have a full year of memories under our belt yet, but it certainly feels like we do! There are so many to choose from, however the one that stands out the most right now was the first time I truly felt LOVE from my daughter. About a month back, I had just fed her and put her down in her crib to sleep. Usually she'll either be out cold already or very sleepy, but on this night she was quite alert. We locked eyes for a long gaze and she smiled the sweetest, happiest smile at me! I melted - it was so heart warming! Over the last couple weeks we've been enjoying new memories of her grabbing excitedly at everything around her - including food! So it would be soo terrific (and timely!) to win this Baby Gourmet pack as we'll be starting her on solids very soon!